Attending a Regional SAREX (Search & Rescue Exercise) – through the eyes of a ‘newby’ . Preparing for a SAREX is always an exciting time, catching up with the guys and girls from around the North is always eventful. The latest regional SAREX at Matakana was going to be challenging, and packing for an overnighter out in the bush was a new experience for me. My job as part of the team was the map holder and navigator. The day dawned crisp and clear, no wait it was drizzly and overcast. Thank you for the real life training conditions! The foundation Rope course held by SARINZ on the 30 & 31 August 2008 was the largest gathering of NSAR personnel for training purposes since the SAREX at Bland Bay, with a good mix of civilian and police members and with a splattering of FNSAR members thrown in for cultural diversity. We began with a short classroom lesson on the fundamentals of handling rescue equipment and different uses etc and were quickly onto the hands on aspect of knot tying (and bends and hitches!). I don’t think you will find a single person on the course that didn’t get a whole lot out of it and hasn’t come away extremely excited about being involved in Search and Rescue! 21 – 23 November 2008. 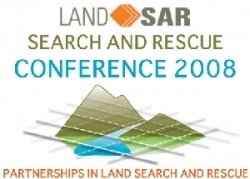 Northland Search and Rescue have been successful in obtaining funding to send several members to this years Annual NZ Land Search and Rescue conference in Palmerston North. Whangärei Police have located a missing 32-year-old Tikipunga man, who has a serious medical condition. The man was last seen at his Tikipunga home at 4 pm yesterday. He suffers from epilepsy and has seizures everyday. As a result of the constant seizures he has slow speech and needs to take medication up to three times a day. A group of terrified teenagers had to dive underwater in pitch darkness to escape a flooded cave during a dramatic rescue near Waipu last night. Rescuers battled for four hours to save the Auckland students who were trapped by a rapidly rising underground stream. 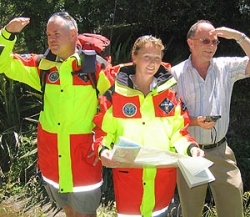 FINDING FUNDING: Northland Land Search and Rescue members Kevin Bell, left, and Jenny Calder have had to search high and low for funding, but Whangarei Lions president Merv Williams, right helped by funding two GPS mapping systems. Their jackets were funded by Pub Charities.